Organic High Natural Chromium by EnergyBalance™ contains organic chromium yeast combined with organic turmeric, which has a variety of health benefits and makes the product particularly easy to digest. Suitable for people with histamine intolerance because it does not contain any active yeast. In our organic chromium yeast, the essential trace element chromium was absorbed by a nutritional yeast and incorporated into its cells. Organic chromium compounds are easier for the body to absorb than inorganic compounds. 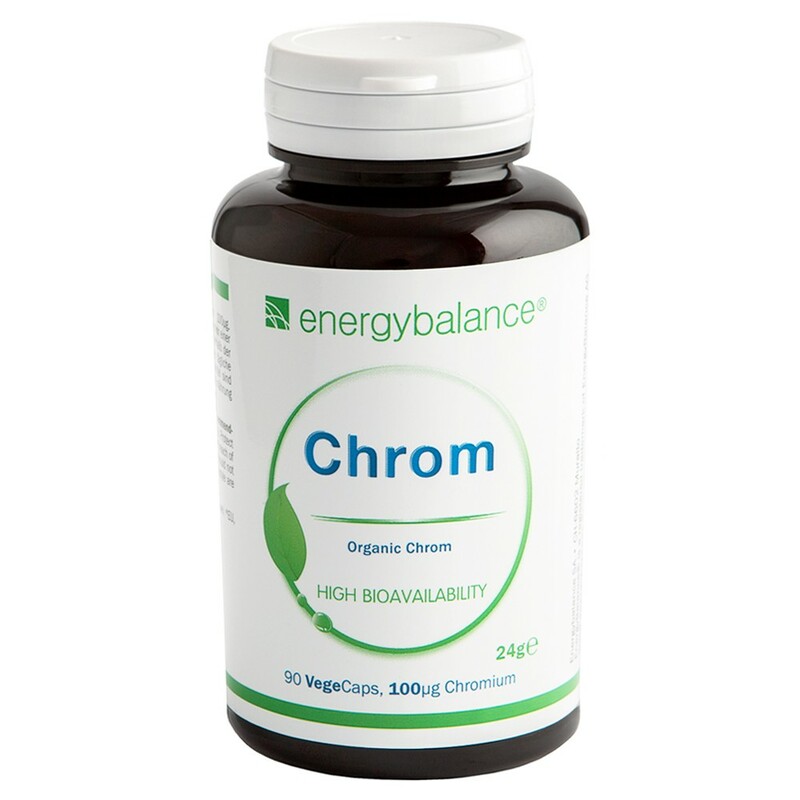 An essential trace mineral, chromium is one of the elements of which the body requires less than 1 milligram per day. Chromium affects carbohydrate and lipid metabolism. Insulin can only effectively do its main job, which is to regulate the body's blood sugar levels, when the body has enough chromium. Blood sugar regulation has a significant impact on weight control. Chromium can lessen and delay signs of aging. Sugar is considered to be the "chromium killer." That is why people who like to eat or drink sweets should especially consider taking a chromium supplement. Contents: 24g = 90 VegeCaps with 100 µ g organic chromium. The trace element chromium is integrated into the nutritional yeast with the help of enzymes in our EnergyBalance organic chromium yeast. In this yeast compound, which contains several special amino acids, chromium can help the body regulate blood sugar. Chromium is a key element in the glucose tolerance factor. Chromium deficiency can impair the effectiveness of insulin. EnergyBalance organic chromium yeast is combined with turmeric, which has many healthy effects on the body and makes the yeast compound particularly easy to digest. 24g = 90 VegeCaps each containing 100µ g of organic chromium.